The television and online images of the horrific damage caused by the recent 7.8-magnitude earthquake that struck Nepal killing more than 5,000 will probably cause an extra dose of anxiety here in Oklahoma. As earthquakes rumble through central Oklahoma on a daily basis, scientists are predicting the manmade quakes here could be leading us to large one that could cause massive damage. Could it be as bad as the earthquake in Nepal? Yes. Who can say “no” for sure? 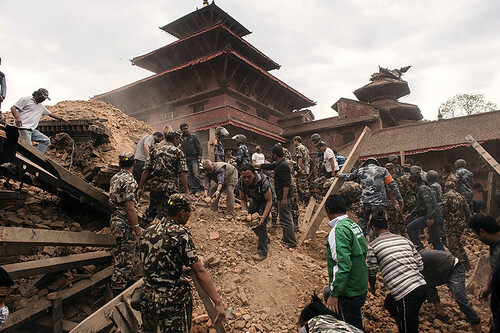 Here are some similarities to consider: Nepal and Oklahoma are not prepared for such an earthquake in terms of the how its buildings were constructed. Both places are in earthquake-prone areas. Oklahoma, just like Nepal, doesn’t have an adequate first-responder system trained specifically for earthquakes. In Nepal’s case, these issues are geological, systemic and related to poverty. In Oklahoma’s case, it’s the fracking process, a matter of lack of experience with earthquakes and what is seemingly emerging as a willful effort to keep information about the earthquakes here from its citizens. Studies show Oklahoma now leads the contiguous United States in the number of earthquakes 3.0-magnitude or above because of oil and gas activities, specifically the hydraulic fracturing, or fracking, process. In that process, wastewater is injected underground by high pressure. It’s believed now by scientists that this injection well process has been triggering earthquakes along the state’s fault lines over the last several years during the fracking boom here. Generally speaking, the oil and gas industry initially denied any role in the earthquakes. That has become somewhat more ambiguous and varying. But it’s highly unlikely any company related to the injection well process would simply take legal responsibility as quake after quake hits us here in central Oklahoma. Some people no doubt will accuse me of fear mongering because of the Nepal comparison. Nepal, for example, is situated in a region historically prone to large earthquakes, but Oklahoma has hundreds of injection wells and has already experienced a 5.7-magnitude earthquake near Prague in 2011. The state has experienced some earthquakes in the 4.0- to 4.8-magnitude range since then. As the shaking continues on a daily so does a steady stream of news about how state officials, in particular, have either tried to hide or have been slow in conveying information about the earthquakes to its citizens. Instead, the agency, commonly called by its initials, OGS, accepted thousands of dollars’ worth of seismic equipment from the company that scientists suspected of causing the quakes, Tulsa-based New Dominion LLC. And for years, they told the public the quakes were natural. This news comes after we learned that OGS seismologist Austin Holland was asked to attend a 2013 meeting with University of Oklahoma President David Boren and Harold Hamm, the head of the oil and gas corporation Continental Resources, to discuss the earthquake issue. To be fair, the OGS just recently issued a statement that it was likely the earthquakes have been caused by oil and gas activities. The state has also created a web site that includes information that connects the earthquakes to injection wells. But we’ve known this information for a long time now. Independent scientists, who have been conducting studies, and the U.S. Geological Survey have been more adamant over the last couple of years at least that injection wells have led to the surge of local earthquakes. Although the OGS and the state government now seem to acknowledge that Oklahoma has a serious earthquake problem that can be related to oil and gas activity, the only major legal action taken so far has been to protect the interests of the oil and gas industry. The Oklahoma Corporation Commission has made some small tweaks on collecting information about injection wells, but a bill making its way through the Oklahoma Legislature would prohibit cities from banning fracking activities within their jurisdictions. Nearly a year ago, the USGS, in conjunction with OGS, issued an earthquake warning for Oklahoma telling its citizens that it should prepare for large earthquakes 5.0-magnitude or above. The only sensible action at this point seems to be shutting down and issuing moratoriums on new wastewater injection wells, but that’s unlikely to happen given the political clout of the oil and gas industry and its economic importance to the state. Photographs from the Nepal earthquake have shown before and after shots of some of its historic shrines, which were reduced to practically nothing but debris and ashes in the recent earthquake. How could any concerned, rational and literally rattled Oklahoman not make the comparison between those photographs and what could happen to their homes here?